Clearly, the extraordinary rates of bullying Sikh American school children endure is not happening in a vacuum. 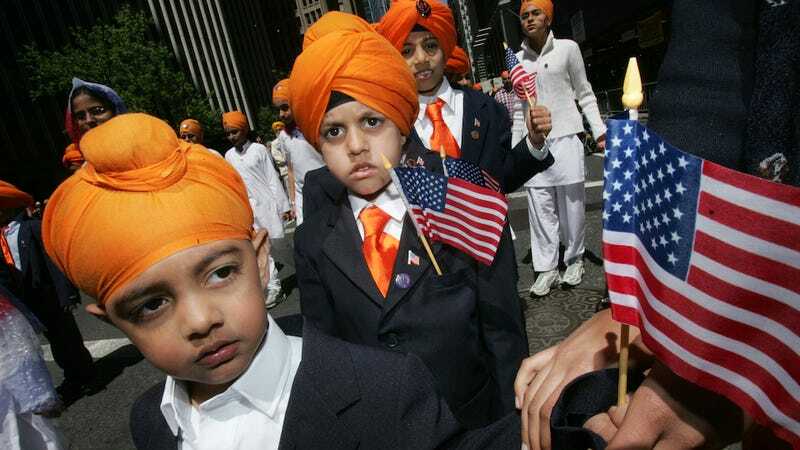 The period since 9/11 has been particularly difficult for Sikh Americans and their children. While Sikh children experience bullying in the classrooms, their Sikh American parents endure astoundingly high rates of hate crimes, employment discrimination, and scrutiny at the nation's airports. Brown skin and turbans have popularly become associated with terror. Crude popular culture stereotypes of terrorists' and damaging media images outside the class room have made their way into the classroom to the detriment of young Sikhs. "The majority of Sikh children from the coasts to the heartland say that bias-based bullying is a part of their experience in school," Singh said in a press release. "We need the help of educators, administrators, lawmakers, agency officials, the media, parents, and children if we are going to end this troubling dynamic." As a brown person who has been jokingly called a "terrorist" on a number of occasions, I can definitely say that it's not a joke. It's harmful, it's racist, it's stupid, and it's about goddamned time we put an end to it.